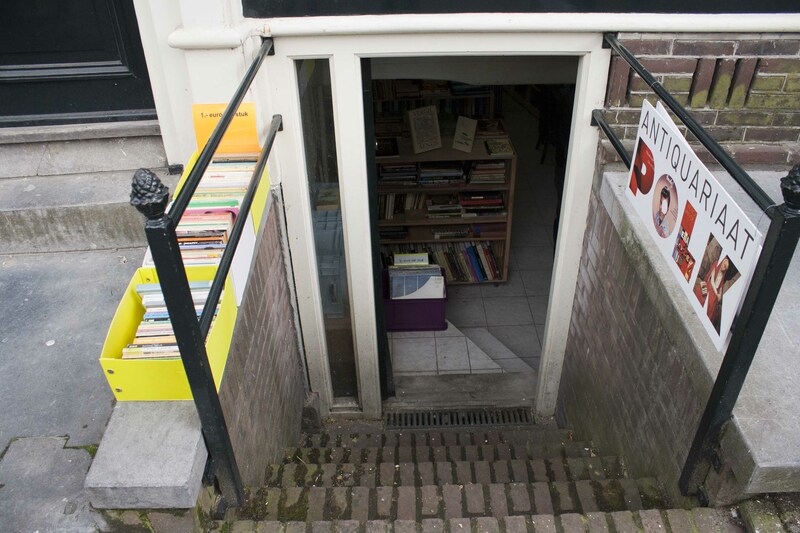 I’ve already spoken about the amazing Singel Canal in Amsterdam that has THREE bookshops in a row. The first one my boyfriend and I visited had wooden floors, high ceilings and a peaceful, airy atmosphere. The second bookshop we came to was quite the opposite. But no windows and cold, artificial lighting can’t put me off, especially when there are brightly coloured bargain boxes outside to lure me in! Instead of going up steps, you enter Antiquariaat POLK by walking down some. At the bottom you find yourself in a small but book-stuffed room. Wooden bookshelves have been well placed so that there is enough space to walk between them. 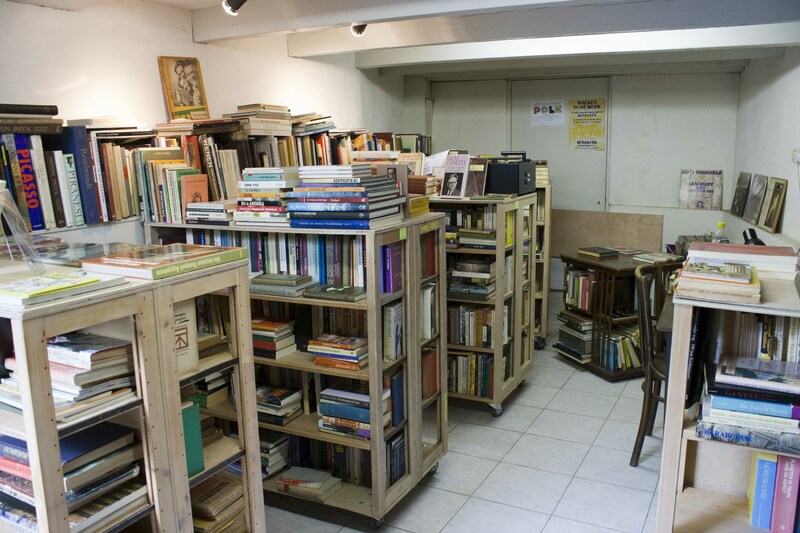 The friendly owner even gave me more space by wheeling the bookshelves around, making room for me to kneel and take a closer look in the English section. I found many brilliant titles, but decided to buy an old Graham Greene book called A Burnt Out Case, which I had never heard of. For €2, I was pretty satisfied. The pricing in the English section seemed to range between €2 – €5, depending on how old and battered the books were. 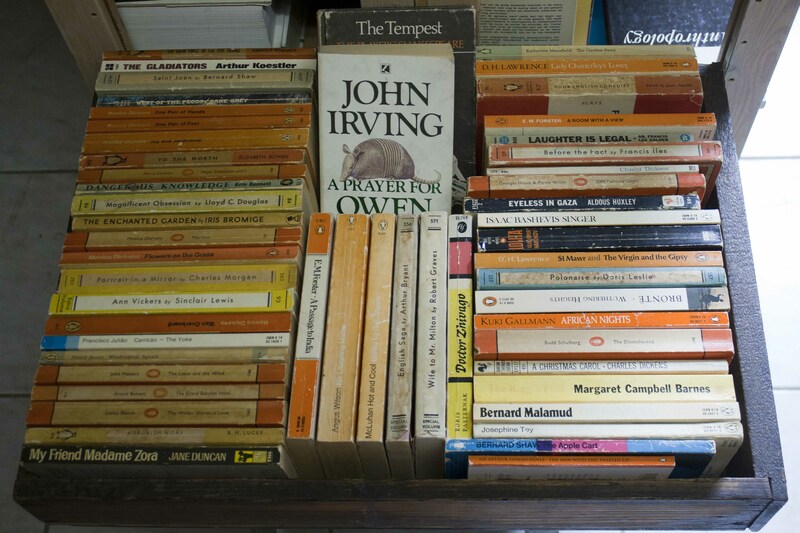 But in the bargain box, I found a load of old penguins and other classics from €1.50. Unfortunately, having limited space and weight allowances on my luggage, I had to be happy with just the one book. Aside from a varied selection of second-hand English books, POLK has lots to offer. Sadly, most of it is in Dutch and so I can’t comment. However, I can say that the atmosphere is nice and cosy, with books left here and there in little piles, as though another bookworm has recently been browsing. Posters and postcards on the wall almost make the place feel like someone’s private library. My very favourite part of my visit to POLK was the special (as the owner called it) “guesht” that turned up halfway through. I do love cats and we had noticed rather a lot of them around Amsterdam. We couldn’t seem to get through breakfast, a coffee, lunch or even an evening drink without hearing a “meow” and having a furry feline rubbing against our legs – and at one point we even had one sitting through a whole meal at the same table as us. Apparently this cat is a regular at POLK and I don’t blame it. There are plenty of uneven piles of tottering books to jump between and boxes to curl up in. The owner told me that there are lots of cats in Amsterdam to keep the mice away! 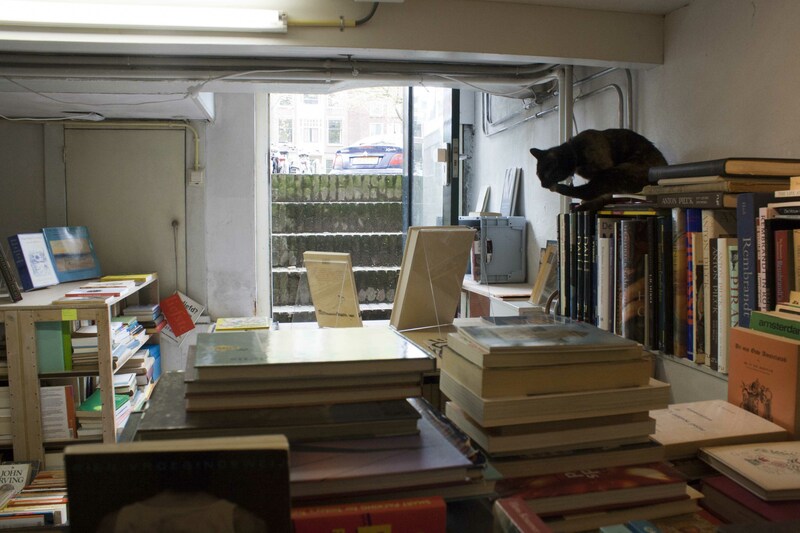 If you are ever on the Singel Canal, you really must check out this bookshop – especially if you are a cat lover! The address is Singel 315, Amsterdam (tel: 020-7850247). Nowadays we’re offering boths books and records (vinyl). Jazz, pop, blues. Our cat is a jazzcat! Thanks! I hope you have a lovely time in Amsterdam! If you get a chance to visit any of the bookshops and see anything I missed, please let me know! I have a friend staying in Amsterdam over the winter and might visit her, so will hopefully be exploring for more bookshops soon! I know! It’s so cute! It even followed me out the shop and my boyfriend (who was getting bored and waiting outside) said it was just like me to make friends with ANOTHER cat. Whoa! I seriously experienced a high reading this post 🙂 Too hard to resist! Beautiful pictures too 🙂 I’m definitely adding this place to my list of places to visit. Aww thank you very much! I couldn’t believe how many bookshops I found in Amsterdam! I’ve still got one more to write about too! Sometimes the best places are the small little ‘hole in the wall’ places. We used to have a used book store here in town that was in a storage unit. You could barely get between the shelves and it was totally disorganized. But, this made you look through a larger area of books and made it more likely you would find something you weren’t looking for :-). Yes, you can really find the most unexpected things in these kind of places. I do like going into a bookshop like this with no particular book on my mind and just seeing what I find! I could fall in love with this place. Haha! I think I did a little. The cat really helped with that! It was perfect for browsing! There was no pressure to buy anything and the woman who worked there was really nice! 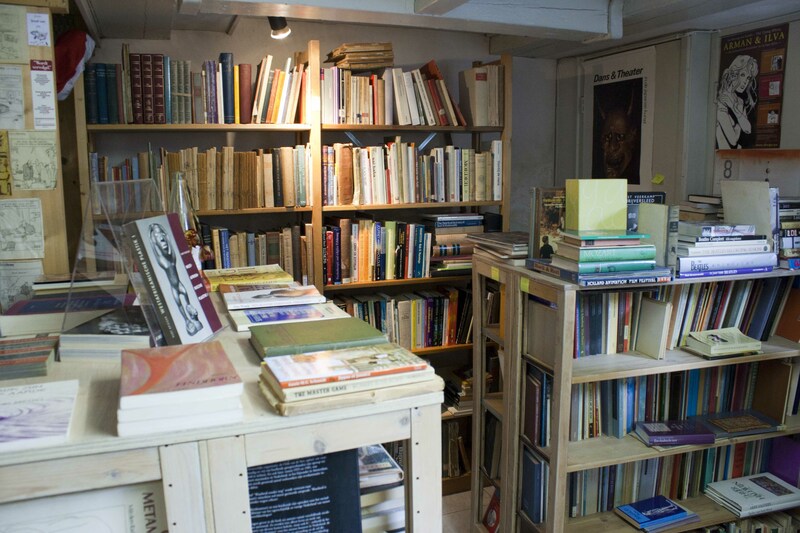 I think it would be difficult to leave without a book though – the prices were so good! Haha, yes I get that too!